The second annual National Day on Writing is coming up on October 20th. It’s an event sponsored by the National Council of Teachers of English (NCTE) to celebrate and make visible the importance of writing in our lives. There are events and celebrations that take place across the country, and there is an online gallery for submitting writing into an archive.It’s a great way to write, get published and join the festivities around writing. The United States Senate got into the act and recently passed a Resolution, supporting the National Day on Writing. Expressing support for the designation of October 20, 2010, as the `National Day on Writing’. It’s nice to see references to the influence of digital media in our lives in the resolution. I am working with my friend, Bonnie, to gather up writing from National Writing Project teachers at our iAnthology site around “writing that we don’t often think about” — the various ways we use writing through the day. But I am still mulling over if I can do something at my school, too. Last year, we did a HUGE comic strip that students from all over the school wrote on, answering the question: what do you like to write? I’ll admit many biases with this review. I am an avid supporter of the National Writing Project, which has given me many opportunities and connections as a teacher, writer and technology dabbler. And I get mentioned in this book, too. (More disclosure: NWP helped co-publish our book, Teaching the New Writing.) So, take my words for what they are — a reviewer who is deeply connected to the work highlighted here, including being an attendee at some of the conferences where conversations helped formulate the start of this book project. But I think Because Digital Writing Matters (to be published this fall for $15. Disclosure: I was sent a review copy) stakes out some important ground in defining the role that digital tools have on the writing classroom and instruction. The book also lays the groundwork of rationale for using various elements of technology in all classrooms, not just writing classes. Writers Troy Hicks, Elyse Eidman-Aadahl and Danielle Nicole DeVoss center their arguments on a number of hooks, including documenting the long history of the National Writing Project in the field of exploring technology and writing, advocating the use of professional development to help teachers not just use but also reflect upon the use of technology, and pushing forth the call for more schools and teachers to consider the possibilities of publishing, rhetoric, voice, mixed media and more that technology brings to the table. I do have a complaint that I need to voice before I move further here. The authors end up defining digital writing as “compositions created with, and oftentimes for reading and/or viewing on, a computer or other device that is connected to the Internet. (page 7)” My sense is that this definition probably came following lots of discussions and debate. I can appreciate that. Digital writing is not clearly defined elsewhere, either, as it is still an emerging concept. Here, though, it’s that “connected to the Internet” phrase that I have trouble with because I don’t think all digital composition needs to be connected to the world via the Internet. Sometimes, we make digital writing on our computers or mobile devices, for ourselves. A digital story, for example. I know that the writers here are trying to demonstrate the predominance of the connected world, the networked spaces that we increasingly inhabit. For me, that connection is important but it is not the end-all-be-all of digital writing. I like and think it is important that much of what we are calling writing falls under the term of “composition,” which involves using elements of words, audio, video, image and more to create a sense of meaning. That mixed-up, mashed-up element is highlighted throughout the book, as is the need to be able to teach those elements to our young writers/composers. The book highlights many NWP teachers in the classroom, showcasing a wide range of projects on various themes: engagement, assessment, curriculum alignment, etc. That is very helpful to have. I know a lot of the folks mentioned here, and admire their work immensely from afar. I like that they are being recognized, even though there are plenty more NWP folks doing amazing work, too. The chapter on the ecologies of digital writing was fascinating for me. I guess I hadn’t given this idea enough thought when it comes to the physical setting of a connected classroom. I have thought about the online environment, but pulling these two strands together (physical and virtual space) was an interesting turn. I appreciated the long list of “traits and actions” that are associated with digital writing because they highlight a vast array of elements of what is going on when young people compose with computers and devices. This list runs from creativity/originality to observations/inquiry to the remix culture. Plus, I am a sucker for lists. The sense of play is all over the stories in this book. We need time to play with technologies ourselves, and we need to give students the time to play and experiment, too. It’s hard to overstate this. The authors use the phrase “double helix” to describe the meshing (or not) of technology curriculum standards with writing standards. I love that phrase because it shows both the connections and the separate qualities of both. The book ends with a powerful call for educators of all stripes to get engaged in the digital world and listen to what our young people are saying about how they communicate, and to recognize the power of technology in the emerging literacies of young people. I’d put this book right on the shelf next to Hicks’ The Digital Writing Workshop, Will Richardson’s Blogs, Wikis, Podcast and other Powerful Tools, and other books that continue to make visible the shifts that are going on underway in education and in our lives. This is worth a view, as fellow NWP teacher Joel Malley (who blogs at Buried in Wires) gives us some insights into the digital work of students and the classroom environment of his classroom. Joel produced this as part of an upcoming appearance at a Congressional briefing around technology and writing in conjunction with the National Writing Project, the College Board and Phi Delta Kappa. 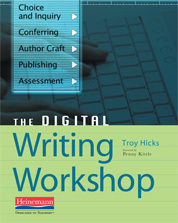 I’m a huge fan of Troy Hicks and his book, The Digital Writing Workshop. It is an incredibly helpful and useful and thoughtful guide to the ways that digital tools can help teachers make the shift with student composition. This morning, I saw an email from Troy that the online component to his book is shifting platforms from a Ning to a Wiki now that Ning is changing its ways. It’s not too late to join Troy and other teachers at the Digital Writing Workshop wiki and engage in conversations about the digital writing world. Here is a video that might pique your interest as teachers from the Central Arizona Writing Project and Chippewa River Writing Projects talk about the impact of technology on writing.